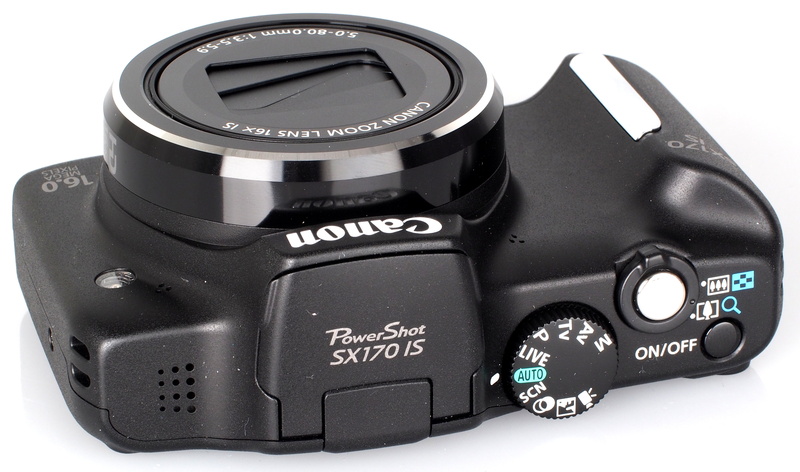 Daniel Bell reviews the Canon PowerShot SX170 IS, a digital camera with a 16 megapixel sensor and 16x optical zoom. The Canon PowerShot SX170 IS was announced in August 2013 and has a 16 megapixel sensor and 16x optical zoom, all in a pocketable body. It is available in red and black for around £149, and updates the Canon Powershot SX160 IS, using a rechargeable lithium-ion battery. 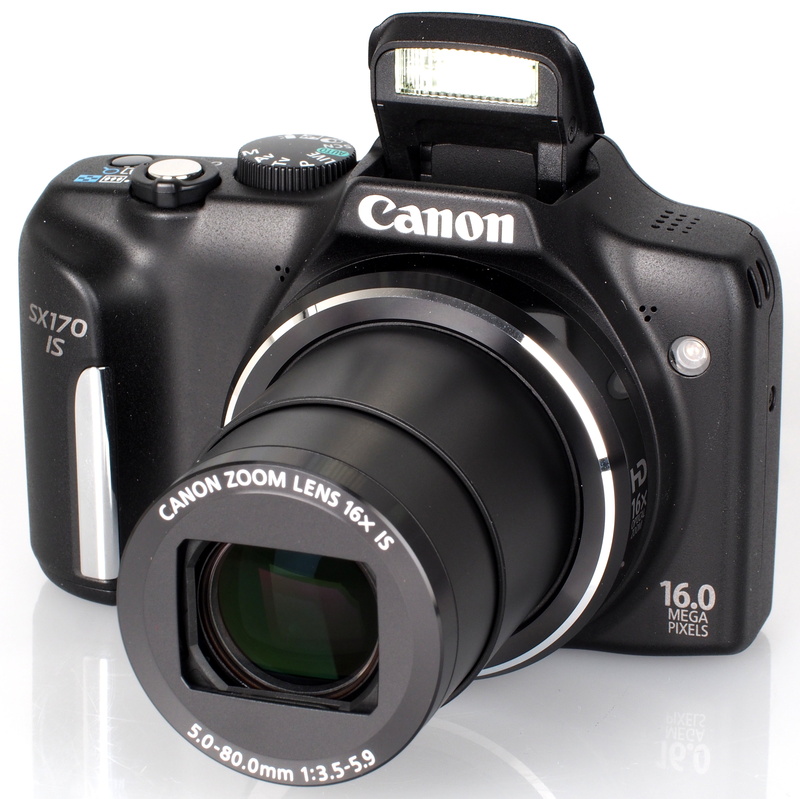 The Canon PowerShot SX170 IS has a 16 megapixel CCD sensor and a 16x optical zoom lens which is the 35mm equivalent of 28-448mm. There is optical image stabilisation to help reduce camera shake and keep your images as sharp as possible. 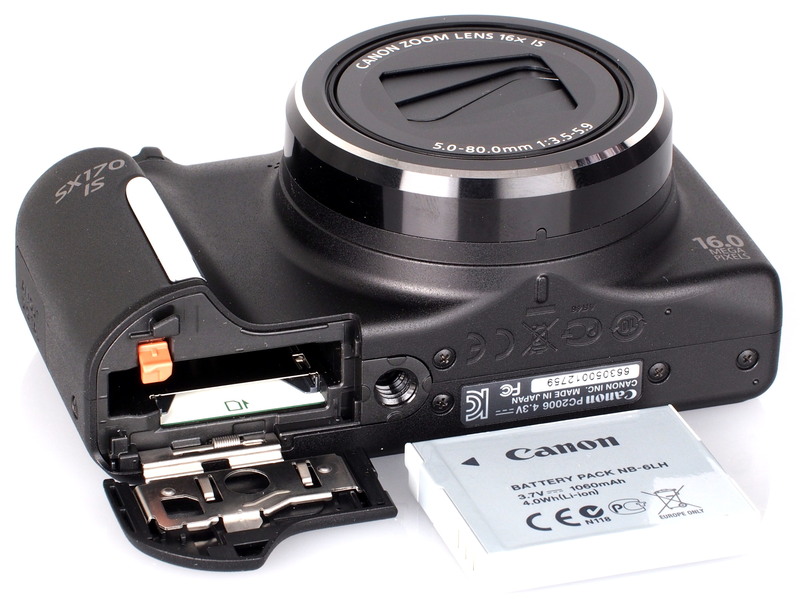 The lens has a minimum focusing distance of 1cm for macro shooting. To help make picture taking as easy as possible there is Smart Auto mode which detects from 32 variables, automatically adjusting the camera settings. For more creativity there are full manual controls where you can set the shutter speed and aperture. There are a number of filters such as Fisheye and Super Vivid. Videos are recorded in 720p HD with stereo sound and optical zoom available. When recording in Smart Auto the camera selects the optimal settings from 21 variables and intelligent IS keeps your videos steady. The Canon PowerShot SX170 IS is small enough to carry in your pocket and has a metal body with a small hand grip and dotted area on the rear for your right hand thumb. 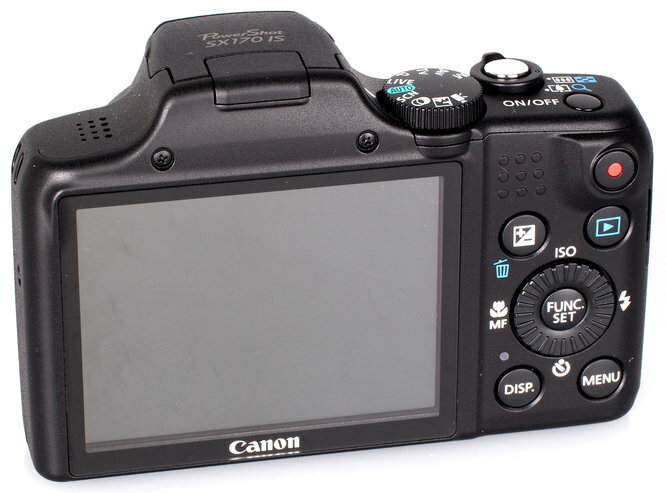 There is a mode dial on the top of the camera which gives access to 10 modes. The flash needs to be manually popped up. There is the on / off button on top alongside the shutter release and zoom rocker. Buttons on the rear include movie record, exposure compensation, playback, display and menu as well as a d-pad, which has a rotating wheel that can be used to set the shutter speed and aperture when using the manual modes. The d-pad also offers access to macro, ISO, flash and self-timer. On the rear is the 3.0 inch screen which has a resolution of 230k dots. The SX170 IS has a simple to use menu system. When pressing the function button, which is in the centre of the d-pad, the picture settings available appear on the left hand side of the screen. Other camera settings are available via the menu button. There are also hints and tips available to help you on your way. Battery life is rated at a decent 300 shots according to CIPA test results, you can get more from you battery by using the Eco Mode - this switches off the screen after a few seconds to save battery life. We took a number of shots to test the camera's responsiveness, from switch on to first photo, shot to shot, focusing speed etc. We take a number of shots and then use the average to ensure accurate and consistent tests, making it easy to compare with other cameras. Continuous shooting records in full 16 megapixel resolution. Sample Photos - Images are well exposed with good colour reproduction. Portrait shots are free of red-eye but skin tones aren't particularly well enhanced by the cameras. Lens Performance - Image detail is good throughout the zoom range, although much softer in the corners. There is also a little purple fringing in contrasting areas. The lens has a minimum focusing distance of 1cm which allows you to get close to your subject for an impressive macro shot. ISO Noise Performance - Noise is low at ISO 100 and 200. Although images are still sharp at ISO 400, there are some white dots appearing. Noise causes images to become soft at ISO 800, with quite a lot of detail lost at ISO 1600, although images will look fine when shared on the web. White Balance Performance - Under the incandescent lights the Auto White Balance (AWB) has a slight orange cast, with the incandescent preset taking a much better picture. Under the fluorescent lights the AWB and fluorescent preset both perform well. Digital Filters - There's plenty of options to help you take creative shots. You can choose from one of the 'My Colours' or enter the filters mode and choose from effects such as toy camera and miniature. Video - Below is a video recorded in 720p HD. The video also includes use of the optical zoom. Quality is good and the focus is quick to adjust when zooming. 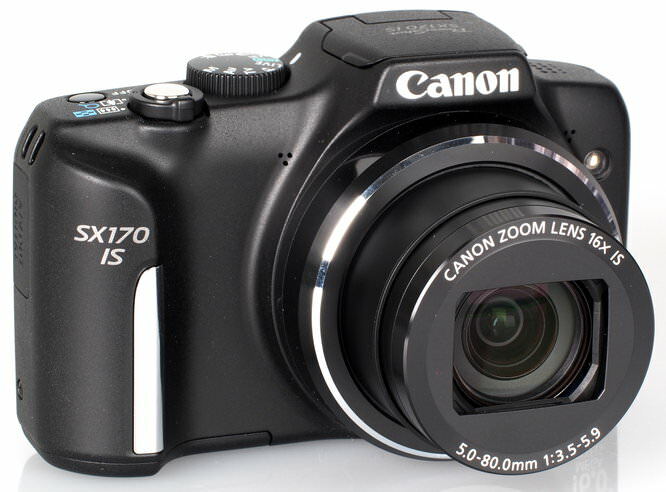 The Canon PowerShot SX170 IS is available for £149. Other cameras with a similar amount of zoom include the Ricoh HZ15 at £96 with 15x optical zoom, Samsung WB250F at £124, and Nikon Coolpix S9400 at £163, both with 18x optical zoom. The Canon PowerShot SX170 IS is an ideal camera for those who want a cheapish camera which is pocketable, yet packs a little more zoom. It's easy to use and there are a range of filters for creative photography, so will appeal to those who like to upload shots to sites such as Facebook.